This song is a expression of bass riffs against a giant Dogzilla. We asked Pete to play a few riffs along to a couple of patterns. Mixed them up a bit and then added some effected recordings of Pete’s dog to the mix as Dogzilla. The idea is of bass defeating Dogzilla and saving Tokyo(?) perhaps? OR is it symbolism representing our darkest selfish urges (Dogzilla) being kept at bay by the relentless pounding of day to day life that moves and darts in different directions (the bass). No, it’s just bass versus a big dog monster. 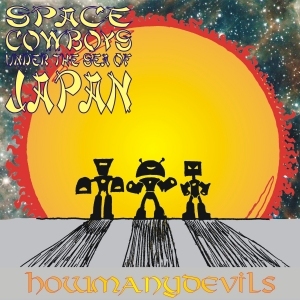 This entry was posted in Space Cowboys Under The Sea Of Japan and tagged bass, dogzilla, DogZilla Versus The Under-Sea Bass, Free jazz, HMD, HowManyDevils, Japan, SCUTSOJ, Space Cowboys Under The Sea Of Japan, Tokyo. Bookmark the permalink.